Trends in pool construction come and go. Sometimes, though, there are trends that are worth your time and attention! Here are three pool trends that pool builders are recommending to their clients. Are these trends worth adding to your pool design plans? Smart-home automation is becoming more and more mainstream every year. Your pool will be no exception! Pools are becoming easier to own as smart systems make the process of cleaning and managing your pool a breeze. Lighting, temperature, and even cleaning schedules can all run from a smartphone. While it won’t eliminate the need for professional pool cleaning, it will help ensure your pool is ready-to-use between visits. Look for even more innovations in this area in the coming year. It used to be that you needed a large plot of land if you wanted to consider adding a pool to your property. That’s changing. Home buyers are looking for smaller properties that don’t require so much of their time and maintenance. This trend is extending to their pools. Many people adding pools to their properties want pools designed for entertainment and luxury as opposed to something they can do laps in. Smaller sizes often mean they can spend more on quality materials and custom add-ons, too. In the coming year, the focus for pool owners is relaxation. 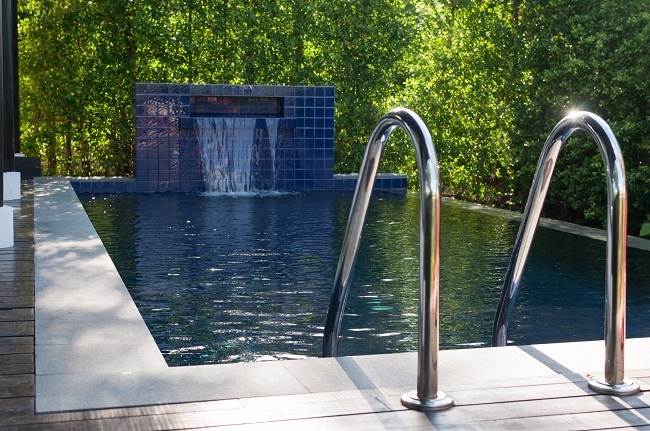 That’s why you’ll be seeing more hydrotherapy spas than ever added into custom pool designs. These spas offer warm water relaxation with jets that can target sore muscles and release tension. While pools are getting smaller, these spas are getting bigger as pool owners place heavier importance on creating comfortable, relaxing spaces for themselves and their families. Want to incorporate any of these trends into your pool construction plans? The Varsity Pools team can help! Get in touch with our experienced pool builders today to learn more about our pool and patio design services.